SOMERS — In February 2015 ASM received a letter from Somers Fire Department President Timothy Percoski praising and thanking Dave White, one of ASM’s Johnson Medics, for his service to the Department and the area. ASM’s Johnson Medic, also known as Alpha 5, works in partnership with Somers Fire Department, Stafford Ambulance and is stationed at Johnson Memorial Medical Center. On behalf of ASM, we are enormously proud of Dave and all of our Johnson Medics and of our longstanding partnership with Somers Fire Department and its dedicated and talented staff. “Caring” Excellent Care. My 1st Ambulance “ride” in my 74 years! “Outstanding” (14-109079; R. Fross, J. Rassmussen). Everything was perfect! (14-105492; E. Dombroskas, S. Howard). Efficient. They took my complaint serious(ly) and did the questioning in the ambulance. They wasted no time in getting me to the ER. Best experience my family has been through. Thank you! (14-108887; D. Noyes, A. Selko). Both very friendly and professional. (14-101010; H. Mendes, R. Houser). Excellent, prompt, professional service. Thanks. (14-108399; R. Buechele, M. Kleza). Friendly and caring on way to hospital. Caring and reassuring. Very kind and calm. The [EMS Provider] riding with me [M. Tuttle] was very knowledgeable and told me what he thought it was and he was correct. (14-109247; M. Tuttle, R. Fross). The lead paramedic was great & kept me informed and calm through the whole process. A big “Thank You” to him. (14-108998; D. Kemp, S. Finnigan). Thoroughly professional, but comforting + caring. (14-106928; P. Ryzak, E. Grey). Very professional + caring when taking care of my son. Very professional, caring, understanding. (14-108287; C. Haag, S. Yenco). Calming for everyone (14-108107; S. Crittenden, R Fraley). I had confidence that my mom was going to be transported to Manchester Memorial Hospital in a competent and professional manner. Knowledgeable, efficient, professional + caring. (14-102310; G. Geres, C. LaChance). The ambulance crew was very professional. Great job! Thanks. Professional and private. I have worked with this crew before. They were professional and understanding. (14-84727; J. Bak, S. Yenco with East Hartford Fire Department). I found [Patient Name] unresponsive (dead) on couch. EMT/Fire Dept arrived quickly – zapped him a few times + brought him back to life. He traveled in ambulance w/ medics so I can’t (nor he) comment on the ride! Thank you! (14-101802; M. Guertin, K. Twohig with East Hartford Fire Department). Your medics were “wonderful”!! (14-105703; M. Karr, S. Jachym). Above + beyond care – Anticipating my needs + safety! (14-105880; M. Tuttle, R. Fross). Very good with caring for my kids’ anxiety w/ the situation. (14-108718; E. Dombroskas, P. Piotrowski). (L to R): Terrence Wain, Jennifer Pasquale, Hartford Hospital’s David Bailey. HARTFORD – As of February 3, 2015, Aetna’s Terrence “TJ” Wain has been cleared by Hartford Hospital medical control for independent dispatch as a paramedic to the towns that Aetna serves. TJ’s preceptor was Paramedic Jennifer Pasquale. The full precepting phase can take ten to 12 weeks or more as the paramedic is prepped for the realities of the field. As with all precepting phases at Aetna, TJ’s final approval came from Hartford Hospital after shadowing Terrence and his preceptor in the field as they responded to emergency calls. TJ started at Aetna as an EMT-Basic in 2014 and graduated from the Capital Community College Paramedic Program. Initially from Waterbury, TJ resides in Wolcott and volunteers for the fire department there. 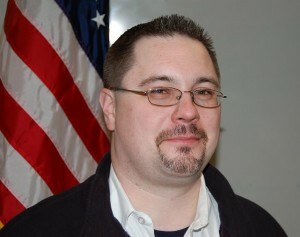 A graduate of University of New Haven with a Bachelor’s Degree in Criminal Justice, he was President of the New Haven Alumni Association until attending Paramedic school at Capital Community College. TJ actively DJs events and stays fit through cross-fit and other endurance activities. On behalf of the Aetna Family, we would like to wish TJ the best of luck and say we are very proud to have such skilled professionals on staff. 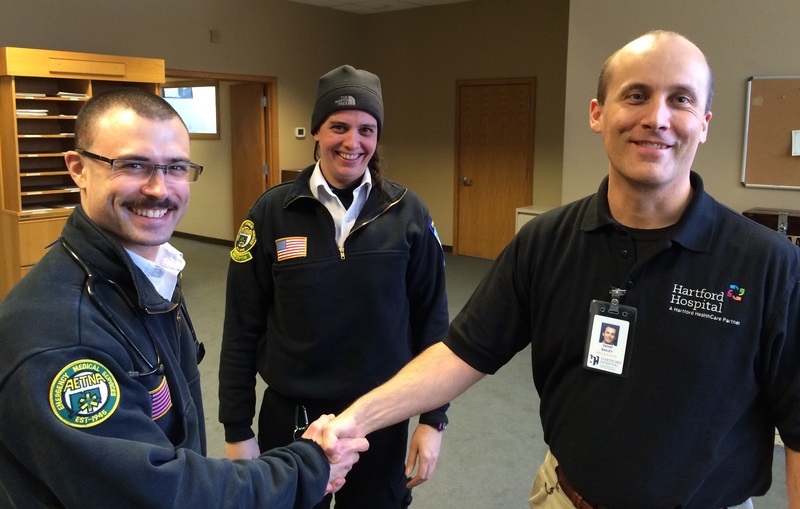 MANCHESTER — On February 4, 2015 five EMTs were added to the ASM team. As part of our continued growth ASM and Aetna seek out only the best candidates. We look for employees who are focused on high-quality patient care, are team oriented and conduct themselves in a professional manner. During the orientation, employees learn about company philosophy and goals, quality assurance, and policies and procedures. Tiffany Armas: FULL TIME, EMT. My name is Tiffany and I’m 23 years old. I was born in Caracas, Venezuela and moved here when I was ten. I graduated from UCONN in May with a B.S. in Allied Health and a minor in Biology. I currently work per diem at the UCONN Student Health Services Laboratory and I’m trained in phlebotomy. I love working in the medical field and am super excited to be involved in emergency care. In my spare time I like to cook, practice yoga, and anything involving being outdoors. I’m also trying to teach myself Portuguese and after that, hopefully another language. I love traveling and learning about different cultures and hope to one day be able to volunteer around the US as well as the rest of the world as a doctor to help communities in need. Cheryl Everest: FULL TIME, EMT. My name is Cheryl Everest I am 23 years old and currently live in Simsbury. I take great pride in helping people everyday in our community. I took my EMT course three years ago and almost instantly fell in love with EMS. I recently graduated from Tunxis Community College with my associates. In my spare time I like to hike with my dog and spend time with my horses. I also volunteer with Simsbury Ambulance. I could not be more pleased to be able to turn my EMS passion into a career with ASM. I plan to further my career in emergency medical a services and become a paramedic. Patrick Gleason: FULL TIME, EMT. My name is Patrick Gleason, I am 43 years old and l live in Manchester, CT. At age 18 I joined the Army and served four years active duty with the 25th Infantry Division. I assumed the duties of squad leader and particularly enjoyed the time I spent at Combat Life Saver School. I went on to work as a Regional Director and Project Manager in the business world but always yearned to acquire an occupation in the medical field. 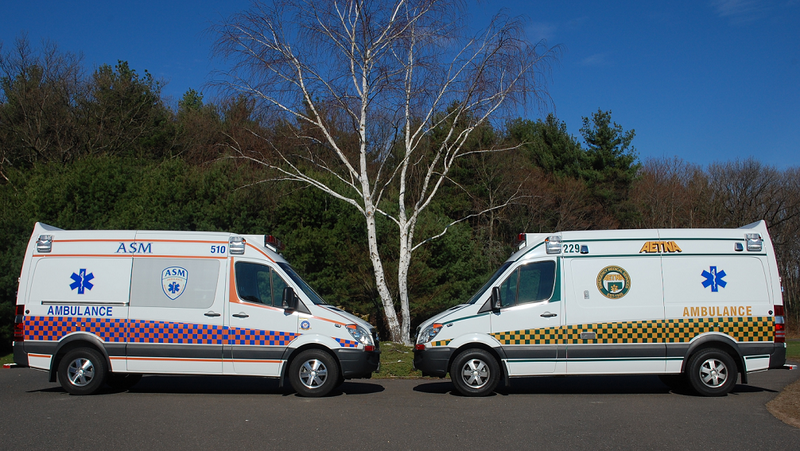 In 2014 I completed an EMT course at Code One in East Hartford and obtained my license. I love to learn new things and am looking forward to a more meaningful career by making a difference in the lives of those I serve as an EMT. The experience I will gain in the field as an EMT will help to prepare me for my ultimate goal of becoming a Paramedic. I spend my free time with my wife and two kids, attend and volunteer at our church and am assistant coach for basketball at the kids school. I am excited and grateful for this new opportunity. Jonathan Sanchez: FULL TIME, EMT. My name is Jonathan Sanchez and I am 22 years old and from New Britain, CT. I graduated from Tunxis Community College with an Associate’s Degree in Criminal Justice. My career goal is to become a police officer and to do the best I can to support the communities and the laws in place. In 2012 I got my first job at St. Francis Hospital & Medical Center as a transportation tech. With this job I became exposed to the hospital environment and was intrigued by the hospital environment and how much health care providers make a difference in the people they help. That’s when I decided to become an EMT. I obtained my certification last year and since July I have had the pleasure to work in the Emergency Room as an ER Technician which is basically an EMT within the ER. I have seen many different types of patients, from basic toe pain to cardiac arrests. I have done all types of different jobs and procedures within the ER and I love the fact that I get to actually help people out when they are in need and potentially help save a life. I look forward to working with the ASM crew and learning new things and incorporate what I already know on the road. I look forward to the future with the ambulance service and hope to take what I have learned and incorporate that in my career later on in life!